Click the button below to add the Konica KM1024 MHB 14PL to your wish list. The Konica Minolta KM1024 MH print head is a robust, shear mode, piezo on-demand print head that is usable in both binary and 8 level greyscale mode, providing variable drop size and higher print quality without the use of additional print heads. The Konica Minolta KM1024 MH print head is a vast improvement over the KM512 print head series, offering twice the print width and double the level of greyscale. 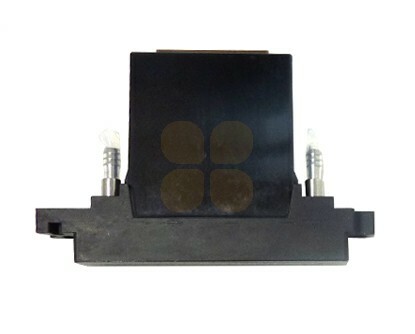 Konica Minolta piezo on-demand inkjet heads are driven using lower voltages than other inkjet heads and the new actuator used in the KM1024 reduces power consumption even further. The Konica Minolta KM1024 MH print head has 1024 nozzles with a droplet size of 14 pico litre and a native resolution of 360 dpi. The print head has an integrated heater, which makes it ideal for UV inks, but suitable for solvent inks as well. This print head is also known as the Konica Minolta KM1024 MHB. This is Konica original print head and it includes the Head ID and the necessary waveform information. It carries a product warranty.